Goodreads: Ask a woman about her hair, and she just might tell you the story of her life. Ask a whole bunch of women about their hair, and you could get a history of the world. 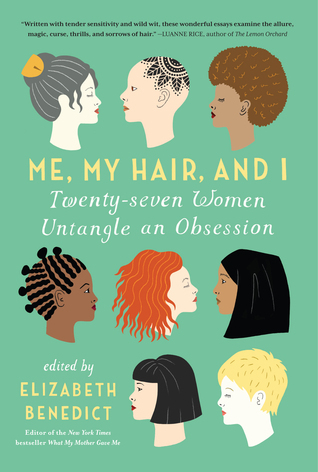 Surprising, insightful, frequently funny, and always forthright, the essays in Me, My Hair, and I are reflections and revelations about every aspect of women’s lives from family, race, religion, and motherhood to culture, health, politics, and sexuality. The long and the short of it is that our hair is our glory—andour nemesis, our history, our self-esteem, our joy, our mortality. Every woman knows that many things in life matter more than hair, but few bring as much pleasure as a really great hairdo. Kritters Thoughts: A book that focuses on something that mostly affects women and each woman has good moments and not so good moments with it - HAIR! There are good hair days and bad hair days and maybe even bad hair months or years! Each woman has a relationship with their own head of hair and through our lifetime we make changes for different moments in our lives and they tell a lot about ourselves and the people we are. Like in all short story collections, there were a few stories I enjoyed less than others. BUT there were some stories that I completely adored. I loved the stories that made me think about women with different hair and background as I do and how that defines them. I loved the stories that stepped me outside of my comfort zone. There were many things I didn't know about different cultures and the way they approached hair both in childhood and adulthood. It was so interesting to read about how hair is approached and how going against what your culture dictates can be a big deal. The story that sticks out the most to me is the cancer survivor that was in between treatments and had grown a bit of hair. Knowing she was going to lose it again she went in to a barber for a shave and he did "hair tattoos" and through social media he now does them for cancer patients and survivors and how meaningful a purposeful hairdo can affect someone completely. I adored this collection and would love to find another collection in the same vain that takes a concept and looks at it through multiple lenses. Anyone have suggestions of what other collections like this?